We are Bengal cat breeders in the South of England. We have kittens ready now Jan 2013. Nevaeh Bengals & Leopardstar Bengals are 3 generations of hobby Bengal cat breeders, breeding high quality pedigree domestic Bengal kittens in the South of England. We often have some stunning Bengal kittens for sale. Our Bengal kittens are bred in the home with children so they are really friendly, used to all sorts of household noises and completely litter trained. They have excellent temperaments as they have been handled daily from birth. 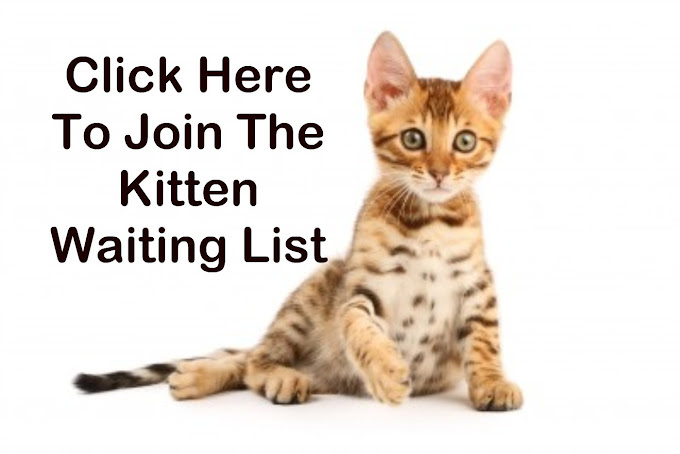 They are GCCF registered, fully vaccinated, wormed, insured (4 Weeks) and you will receive a free Bengal kittens pack to help settle your new Bengal kitten into its new home. Have you dreamed of owning a good natured domestic cat that resembles the magnificent Asian Leopard Cat but in a 10 – 17 pound package. If the answer is yes. Then the Bengal Cat could be just what you are searching for. Bengal cats have been bred to resemble miniature leopards but with the temperament of a domestic cat. The domestic Bengal has inherited the stunning wild spotted pattern of the Asian Leopard Cat while retaining the loving friendly nature of the domestic cat. Bengals cats are unique in that many love water - some will even swim! Many enjoy chasing balls, and running on wheels. They can often be trained to walk on leads and do tricks, they are highly loyal, talkative and have amazing jumping capabilities. Nevaeh Bengal Cat Breeders breed friendly, healthy Bengal kittens for sale from stunning Champion rosetted, glittered Bengals. Bengal Cattery & Bengal Cat Breeder in Wiltshire with Bengal Kittens for sale. All of our Bengals Cats & Bengal Kittens are pets first and they all live in the house with us. Nevaeh Bengals are domestic Bengal cat breeders based in Wiltshire with Bengal kittens for sale & Bengal cats for sale a few times a year. You will find photos of our pedigree Bengal kittens for sale, Bengal cat for sale, Bengal cats for sale at Bengal Kittens Wiltshire. Our Bengal kittens come with a free Bengal kitten pack, a full course of vaccinations, free 4 weeks of Petplan insurance, GCCF registration and a 5 generation pedigree.